Last month, I was invited by Circ-Cell to try a brand new facial centered around their products at Toccare Med Spa. Licensed cosmetologist Julie did my facial. Once I was on the table, she began with a hand treatment involving a thick hand cream, plastic bags and electric hand warmers. At the the time, I was smack-dab in the middle of packing up my house to move, so my hands appreciated the special, moisturizing attention. Following a bit of steam to open my pores, Julie began with the Circ-Cell Geothermal Clay Cleanser. This cleanser is half oil, half clay and feels creamy and moisturizing with a nice, earthy scent. And this is no ordinary clay, but special clay from the Arctic Circle. It’s suitable for all skin types and can be used once a week as a mask by leaving on for 10-15 minutes before rinsing. Next up was Toccare’s signature facial technique, the lymphatic massage. This is a special treatment that massages certain points in a sequence to encourage drainage of your lymphs where toxins can collect. The massage was very relaxing, working all between the hairline and the chest area. Following the lymphatic facial massage, Julie applied the Circ-Cell Dew pH Perfector. It’s like a toner, but you apply it by soaking a cotton pad and then pressing it into the skin for about 5-10 seconds at a time. Ingredients include amino acids, camphor and witch hazel. To be honest, I’m not completely sold that toner-type products are suitable for my skin type, but I can see how this would be a beneficial product for many, particularly those with oily skin. Next up is “climax” of the Circ-Cell product line, the REM Masque Serum. This set includes “Liquid” and “Dust”. To use, you mix 5-6 pumps of the Liquid with one small scoop (scooper provided) of Dust and mix in your hands. Then you apply to your face and neck and leave on overnight, only using up to six nights a weeks. There are more than 50 active ingredients, and the Dust includes amethyst and tourmaline powders. Fancy. Both products come in dark violet glass bottles to protect from light degradation. Once the REM Masque Serum was applied, Julie used a NuFace microcurrent tool. It’s possible you’ve had this tool used on you during a facial (I had). You can read about how this facial toning device works here. Julie then wiped off the REM Masque Serum with a washcloth and reapplied the Dew pH Perfector. Next up was the ABO Blood Serum Rejuvenating Eye Gel, another marquee product of the Circ-Cell line. Up front, know that this eye gel has no ingredients derived from blood products. The name comes from the oxygen-delivering agents in the serum. You apply a teeny amount around your eyes, but not on your eyelids. Finally, Julie applied sun protection and then sent me on my way. I found Toccare Med Spa to be a well-appointed, centrally-located, expertly-staffed medical/day spa that offers many aesthetic treatments well beyond facials. I’m looking forward to learning more about Circ-Cell. The product representative was kind enough to send me home with the products that were used during my facial, and I just started trying them out at home this week. 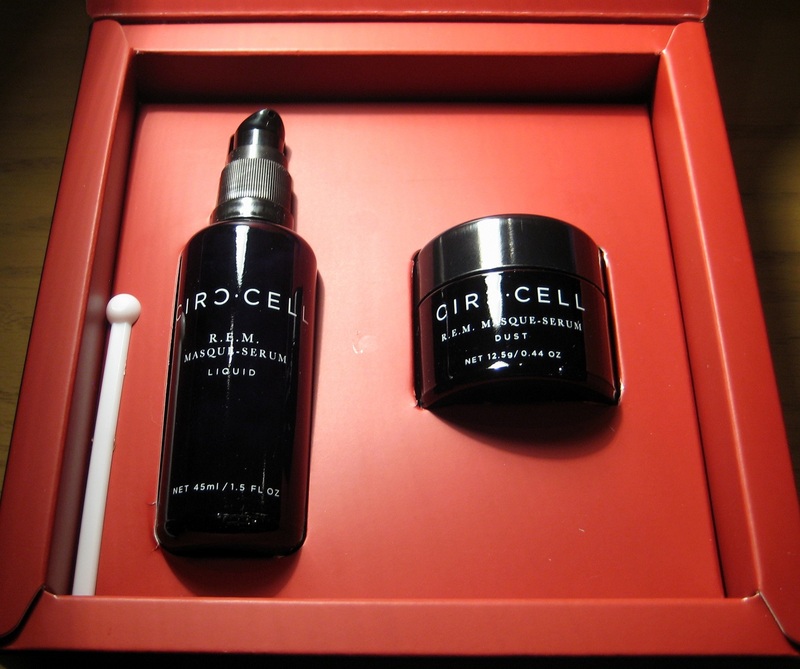 Since my facial, Circ-Cell has launched a new product, an ABO Blood Serum for the face. Sounds like a great addition to line, so that you have a daytime product to complement the REM Masque Serum. Check out the Circ-Cell website to learn more about this buzz-worthy, innovative skincare line. I am really pleased to see that other product lines are embracing the notion of not over exfoliating and stripping the skin of its protective barrier mantle. I’m an esthetician who fully subscribes to the practice of building the skin, from the inside out and the outside in, using non-wounding procedures that truly rejuvenate. I love what I do! Thanks for reading the blog and providing your expert opinion!